In yet another move to increase the salaries of low-wage workers, the labour movement is proposing that cleaning companies agree to follow national wage guidelines before they can get a licence. All cleaning companies will be licensed from next year. Labour chief Lim Swee Say said yesterday that tying licensing to wage guidelines will help cleaners' pay keep pace with inflation. There are about 69,000 cleaners, and the median wage of Singaporean or permanent resident cleaners is $815. "Our commitment to you is that your wages will continue to move up," he told about 60 cleaning staff at the launch of the National Trades Union Congress' I Care for My Cleaners campaign. Last month, the tripartite National Wages Council (NWC) suggested a pay rise of at least $60 a month for workers earning up to $1,000 - mainly those in the cleaning, security and landscaping sectors. This was an increase from last year's NWC recommendation of at least $50 for such employees. But only three in 10 companies heeded that call last year. Mr Lim proposed the NWC's guidelines now be made part of the NTUC's progressive wage model, which sets out a career ladder with pay standards for low-wage workers in various sectors. 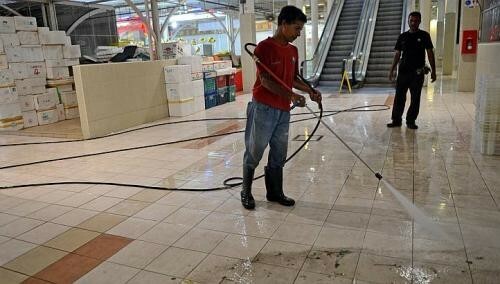 It has already been announced that cleaning companies must follow NTUC's progressive wage model to be granted a licence. This model sets pay at $1,000 for indoor cleaners and $1,200 for those who work outdoors. If the NWC link is approved, cleaning firms will have to pay at least $1,000 to local workers from next year, plus any pay rise recommended by the council, if they are to get a licence. "It does not make sense if you have put in place a ladder, and yet you do not apply the NWC guidelines onto this ladder," Mr Lim said at the campaign launch at AMK Hub. "Then workers will get stuck again, but at a different rung of this ladder." But he added that the NTUC's plans are "subject to us convincing our tripartite partners". Mr Milton Ng, president of the Environmental Management Association of Singapore, an association of cleaning firms, could not be reached for comment. But the heads of associations for the security industry - another low-wage sector - were worried about similar requirements being imposed on their industry. "There is a possibility that they will try," said Association of Certified Security Agencies president Robert Wiener. Security Association of Singapore president T. Mogan thought his industry should not take any cue from this latest proposal. Mandatory pay rises would be a strain on companies, especially as long overtime hours amplify any rise in basic pay, he said. Yesterday, NTUC also said that its social enterprises, including supermarket chain NTUC FairPrice, are working with service providers to give a $60 pay rise to outsourced cleaners who earn up to $1,000 a month. Two labour movement-related bodies which have already negotiated for the pay rise are NTUC Centre and AMK Hub. More than 50 outsourced cleaners working at these organisations will get their $60 pay increase next month. If the other enterprises succeed in negotiations, another 600 outsourced cleaners will get pay rises this year. Among them is cleaner Jenny Choh, 60, who said: "Every little bit helps."